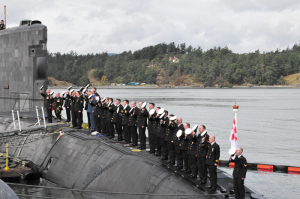 On Sept 3, HMCS Chicoutimi, a Victoria-class submarine currently stationed at CFB Esquimalt, was officially commissioned into the Royal Canadian Navy (RCN). 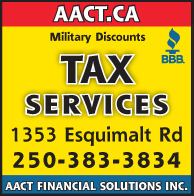 Commissioning is the formal and ceremonial act of placing a ship or submarine in active service. In this case, the ceremony has a significant ceremonial aspect: Chicoutimi was finally able to fly the Naval Ensign at all times. While it was previously able to fly the ensign at sea, it was restricted from doing so at ceremonial events, such as sunrise and sunset ceremonies, until being officially commissioned. With the bright red and white pennant unfurled and the powerful diesel-electric engines brought to life, Commander Timothy Markusson, Commanding Officer of Chicoutimi, declared the submarine commissioned, as dignitaries and guests looked on. “It is truly unique work we do and it is fortunate that we have a platform as great as the Chicoutimi on which to do it,” said Cdr Markusson to the crowd. Once on board, the submariners removed their peak caps and hollered “hip-hip-hurray”, the customary cheer. Their crew`s ceremonial celebration was followed by applause and cheers from those in attendance as the historic moment drew to a close. Those overseeing this historic moment included B.C. 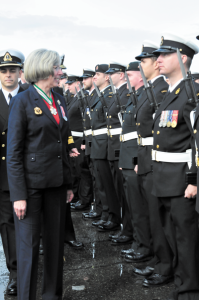 Lieutenant Governor, the Honourable Judith Guichon; Deputy Commander of the Royal Canadian Navy, Rear-Admiral (RAdm) Ron Lloyd; Commander of Maritime Force Pacific, RAdm Gilles Couturier; the Mayor of Saguenay, Quebec, Jean Tremblay, and Chicoutimi Sponsor Marina Larouche. It is a great honour for me to be here this morning for the official commissioning of HMCS Chicoutimi. As a Canadian, I am extremely tired of always being humble and apologetic especially when it comes to our Victoria-class submarine fleet. I realize it is not something that we publically shout about, but buying these stealthy creatures was not tantamount to sinking the fleet. Nobody questions my sanity when I boast of having flown upside down in a Chinese Yak aeroplane. They do however look at me questionably when I tell them that I was privileged to do angles and dangles in HMCS Victoria, and that I am now an Honorary Submariner. I then go on to explain that it was one of the highlights of my incredible journey to date, and that watching the crew on board that day perform their various specific and demanding tasks in the confines of the craft was like watching a ballet, so professionally performed, everyone aware of the movements of others but all attuned to their specific task. And all so silent and green and beautiful down there. In the present environment and with three extensive coasts to patrol, we in Canada are so fortunate to have this fleet involved in marine law enforcement and more than capable of participating in multinational exercises. Whether it is standing on guard against smugglers, polluters or extremists, the unrivalled stealth and deadliness of these sleek creatures is a force to behold. They may not be a thing of beauty like a sleek frigate but they are indeed a force to respect. So it is with great pride that I am here today to congratulate the multifaceted Canadian team that has performed the Extended Docking Work Period on this submarine. To the crew of HMCS Chicoutimi the very best of luck and good fortune as you and your sleek deadly Victoria class submarine begin this next phase of service. 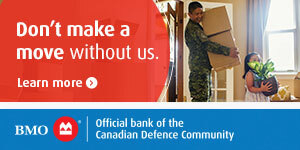 And we who remain behind say thank you to you and your families and all those that support you in this valiant service.